One Million dead and four million homeless, a country devastated, raped pillaged and plundered by the Bush/Blair war machine. Will they ever be brought to trial for their crimes against humanity? Tony Blair's extraordinary admission to the BBC's Fern Britton - that he would have gone to war to topple Saddam Hussein regardless of the issue of Iraq's alleged WMDs - is sure to give fresh impetus to moves to prosecute our former prime minister for war crimes. Blair's admission, that he "would still have thought it right to remove him [Saddam]" regardless of the WMD issue, is also an acknowledgement that he lied to the House of Commons on February 25, 2003, when he told MPs: "I detest his [Saddam's] regime. But even now he [Saddam] can save it by complying with the UN's demand. Even now, we are prepared to go the extra step to achieve disarmament peacefully. I do not want war... But disarmament peacefully can only happen with Saddam's active co-operation." But while it is easy to label Blair a war criminal, what are the chances of him actually standing trial - and how could it be achieved? Various initiatives have already been launched. 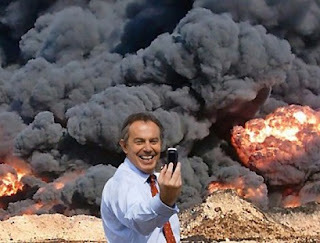 The Blair War Crimes Foundation, set up by retired orthopaedic surgeon David Halpin, has organised an online petition, addressed to the President of the UN General Assembly and the UK Attorney General, which lists 14 specific complaints relating to the Iraq war, including "deceit and conspiracy for war, and providing false news to incite passions for war" and violations of the Geneva Conventions by the occupying powers. One of the most insidious insults is the award of the Liberty Medal for humanitarian causes handed out to Blair by the American Government and of course his hypocritical new post as Middle East Peace Envoy. Has the World Gone Mad or is it just run by Insane Murdering Criminals?